My kids just eat up facts like these! What a plethora of information that kids want to know about! They are learning history and don't even know it. This book is full of great facts, wonderful photographs and amazing history. New York, NY– If you were asked to come up with a list of the most important events, inventions, people, or discoveries in the past 100 or 1,000 years, what would you choose? 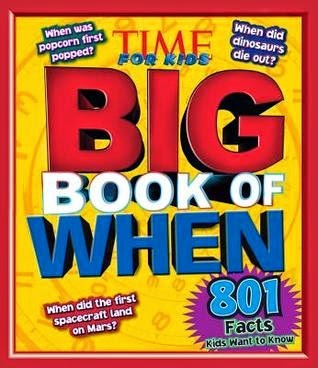 The editors of TIME For Kids did just that for the new Big Book of When, the newest release from Time Home Entertainment Inc.’s hugely successful Big Book Series. Big Book of When (Time Home Entertainment Inc.; $19.95) is now available at timeforkids.com/bigbookofwhen and at retailers nationwide. Big Book of When is a riveting new resource for younger curious readers. The engaging and instructive book presents kids with answers to the kinds of intriguing questions that appeal to their sense of curiosity about when the most important events in history happened. At more than 190 pages, the hardcover book is full of colorful graphs, spectacular photos, and clear, engaging timelines to help kids ages 8 and up answer a myriad of questions. 1. When did people begin to use calendars? 2. When did dinosaurs die out? 3. When was the first book printed? 4. When did an airplane first break the sound barrier? 5. When was electricity discovered? 6. When do we see shooting stars? 7. When was the first text message sent? 8. When was the first sandwich made? 9. When did people begin riding on trains? 10. When did the Maya vanish? 11. When was the first Super Bowl?